Tibet, a most unusual and beautiful region in Central Asia is located at the main part of Qinghai-Tibet plateau. 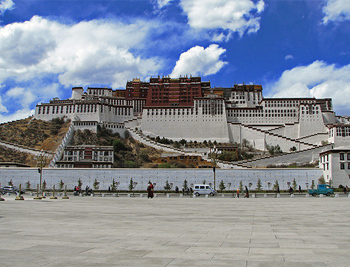 Tibet is also a South-West frontier of China and the home to the indigenous Tibetan people. With an average elevation of 4,900 meters, it is the highest region on the Earth and this is why it is referred as "Roof of the World". At north Tibet borders with Sichuan, Yuannan, Qinghai and Xinjiang; to the south neighbouring to India, Nepal, Sikkim, Bhutan and Burma, and bounded by Kashmir on the west. The region covers an area of around 1,200,000 square kilometres. Tibet Autonomous Region has very complex topography and falls into three geographic parts: the west, the south and the east. When the word Tibet is mentioned something icy chills the readers' nerves. In fact it snows only once or twice in a year and owing to the perpetuity of bright sunshine, it is not at all cold during the daytime even in the coldest of the winter. The earth's highest mountains, a vast arid plateau and great river valleys make up the physical homeland of 6 million Tibetans. Tibet is an eternal topic and dreams of so many people, with its unique high attitude, exotic culture and unique landscapes. It is a place for the rugged adventurer as well as the spiritual wanderer.